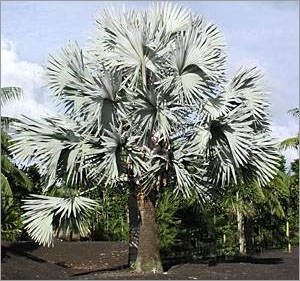 Bismarckia nobilis silver, the Bismark Palm, comes from Madagascar. Because of its size, this Palm needs lots of room to be seen at it's best. In the wild have been known reach up to 100 feet and more; domestic palms grows shorter, approximately 25 feet. Bismark Palm is a very spectacular Palm, and well worth a position in any garden that can accomodate it. Once it establishes itself in cultivation, it tends to be rather fast-growing. 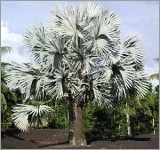 The Bismarck Palm has a full crown of large, silvery-blue, circular, fan-shaped leaves, up to 3 meters across. It is very spectacular. It has stout, smooth, grey trunk. The flowers are pale yellow.